On this date in 1942, just two days after he had assassinated Admiral Francois Darlan, Fernand Bonnier de La Chapelle was shot by the Vichy army in Algiers. Despite its shorthand reputation as a Nazi puppet, Vichy France — especially in 1940-42 — was a more nuanced animal that’s enjoyed increased study of late. Vichy controlled southern France under the obvious pressure of the next-door German occupation and effected state collaboration with Berlin including deportations, but it also maintained diplomatic relations with the U.S. Vichy France even shot German spies. Vichy was one contender among several for political legitimacy in the aftermath of France’s disastrous 1940 defeat at German hands. The most obvious (and here, topical) rival was de Gaulle’s Free French. Appropriately, the classic film Casablanca premiered in November 1942, featuring Claude Rains as the unprincipled Vichy Captain Renault. The film’s pro-Free French, anti-Vichy slant was not, however, representative of American foreign policy at the time. At the time of that operation, Admiral Darlan happened to be in Algiers. He was the former number two man in the Vichy government, but also a guy whose cooperation with the Nazis had been half-hearted … which is the reason he was the former number two man. Darlan nevertheless remained the chief of the Vichy armed forces, which meant that it was worth the Torch commanders’ while to come to an arrangement with him when Darlan proved amenable to cooperation. They cut that deal. Darlan shut down armed resistance and took Vichy North Africa over to the Allies’ side. (He had, indeed, hinted previously to American diplomats that he was prepared to switch sides; see Arthur Funk, “Negotiating the ‘Deal with Darlan'” in Journal of Contemporary History, April 1973.) In exchange, the Allies installed him as High Commissioner of France for North and West Africa — big man on campus for French North Africa. Like all good compromises, it satisfied nobody. De Gaulle was enraged: a Vichy official remained in charge of a Vichy state now under Allied auspices. Would Allied recognition set Darlan up to direct France’s postwar direction? Equally pissed by the defection, Hitler triggered the German contingency plan to occupy Vichy France.† This is why the “especially in 1940-1942” proviso above: after Operation Torch, Vichy France had no independent military muscle, and was significantly more beholden to Nazi Germany. Back in North Africa, we finally come to our date’s principal. 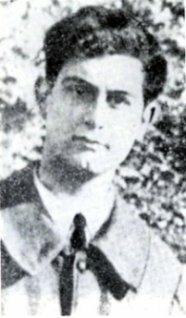 A 20-year-old student of monarchist and anti-fascist political proclivities, Fernand Bonnier de La Chapelle (English Wikipedia entry | French) decided with a couple of friends to cut the Gordian political knot that Darlan’s adoption had created. Bonnier de La Chapelle drew the short straw (literally, they drew straws) for the privilege/responsibility of murdering the Vichy admiral. Officially, the young man acted alone. Unofficially, there’s been no end of speculation as to the secret intrigues at work. Nobody’s really clear on exactly how murdering Darlan was supposed to advance the gunman’s supposed agenda. And the Vichy French disposed of the killer with suspicious haste. Just after lunch on December 24, Fernand Bonnier de La Chapelle surprised Darlan upon the latter’s return to his study and shot him through the mouth and torso at point-blank range. He was arrested attempting to flee. The very next evening, he was condemned by a tribunal at Algiers. There was already a coffin on order before that body gaveled into session. Henri Giraud, a French general who escaped German custody and took refuge in Vichy France — Vichy refusing to return him to the Germans, who openly intended to kill him — succeeded Darlan’s command of the now-Allied-aligned French North African forces and maintained the objectionable Vichy institutions. He joined the Allied Casablanca Conference a few weeks later. Giraud had already secretly arranged with the Allies to take exactly this position and had repaired to North Africa in anticipation of the invasion before being aced out by Darlan. Giraud’s Vichy North African government gradually increased cooperation with de Gaulle’s Free French; the two eventually co-founded the French Committee of National Liberation, which de Gaulle, of course, eventually took control of. * Stalin, whose Red Army was then fighting the Wehrmacht tooth and claw at Stalingrad, begged to differ. He’d been imploring the western allies to open a second front, and was none too impressed with their calculation that they weren’t ready to invade continental Europe in 1942. “A man who was not prepared to take risks could not win a war,” Stalin griped to Churchill. ** One knock-on effect of Operation Torch: the Germans reinforced North Africa against the Allies’ imminent push. It was in this campaign that future Hitler almost-assassin Claus von Stauffenberg lost a hand and an eye, leading to his transfer back to the Berlin desk job that would give him his opportunity to try to kill the Fuhrer. † This resulted in Vichy France’s gesture of resistance, scuttling the Toulon fleet to keep it out of German hands … although this also irritated de Gaulle, who wanted the fleet to defect to North Africa instead.